Les Sœurs grises of Montreal have used the Manoir D’Youville for many years as a place of healing. 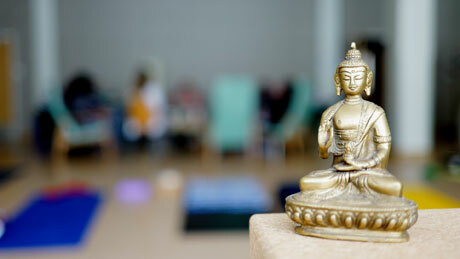 To continue the tradition, we offer conferences or introductory events on different themes related to our well-being. Enjoy the inspired atmosphere of Manoir D’Youville and Île Saint-Bernard to discover or learn more about practices that will breathe new life into your life! Please note that our events are conducted in French. What does mindfulness mean? What can this bring you in everyday life? Through practical, simple and accessible experiences, you will have the opportunity to explore what it means to "pay attention" to the present moment; that is to say to be really in full consciousness. Give yourself the chance to live in the present; to observe and welcome your feelings, your emotions and your thoughts. So, open to the possibility of changing your attitudes and reactions to be better equipped to face the reality that comes your way everyday. To find out more about the mindful retirement that Marie-Andrée Riendeau will be holding at Manoir D'Youville. Places are limited, book yours! With Magali Deschênes, Change Management Strategist (Bombardier) and Life Architect. With Christine Bénard, family herbalist and co-founder of Pearl of the Fields.